As The Gaslight Anthem announce a 10 year anniversary tour of their breakthrough and brilliant record, The '59 Sound, we look back at their debut which helped put the New Jersey punks on the map. 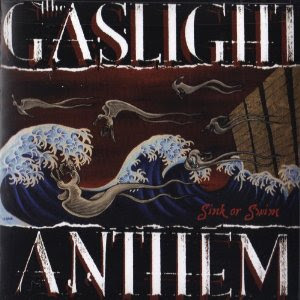 Mixing rockabilly, punk, garage, and straight up rock and roll, The Gaslight Anthem's debut, Sink Or Swim, allowed the emo and indie scene of the early 2000s to take notice to the four lads from The Garden State. Released in 2007, the album is a tribute to their home state and their influences like The Clash, Bruce Springsteen, Bouncing Souls, and Tom Petty. The record is chock full of tunes of a band wanting to be bigger than the bars and clubs they are playing. It is 12 songs of a band who know they can craft anthems that will evoke a feeling in audiences around the globe that will sing along forever with them. Sink or Swim wasn't just a record, it was a statement -- if people took to this album, wait until they hear what we have next or if no one cares, at least we tried. For the band, luckily they were able to swim and a decade on, they are supercharged and ready for more.